Ten years ago, KSTAR (the Korea Superconducting Tokamak Advanced Research) was entering the last phases of assembly. In this picture, taken on 11 January 2007, the KSTAR staff posed to celebrate the completion of "in-cryostat" system integration, prior to the cryostat assembly. Shining like a diamond, with blue reflections from its silver-coated thermal shield, this was KSTAR ten years ago ... ready to be encased in its cryostat. 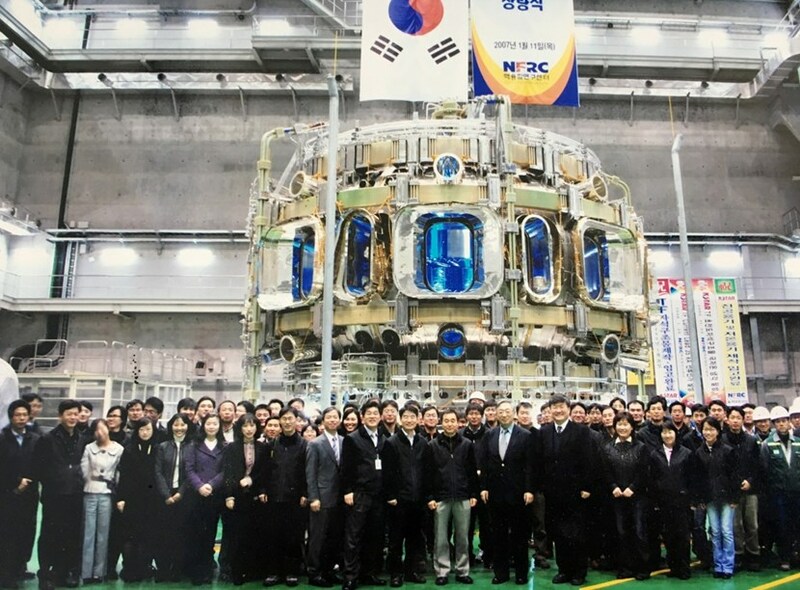 Among the KSTAR staff in the picture, close to a dozen are now working at ITER: Gyung-Su Lee, now ITER Deputy-Director General and Chief Operating Officer; Joo Shik Bak, Head of the Construction Department; Chang Ho Choi, head of the Vessel Section/Division and several others. Eight months after the picture was taken, on 14 September 2007, the construction phase of the project was completed, On 13 June 2008, KSTAR successfully produced its first plasma.